Prime Minister Najib Abdul Razak today launched the national level “Jimat Belanja Dapur” (Reducing grocery bills) programme implemented by the Federal Agricultural Marketing Authority. He said the programme, which was similar to the “Jualan Sentuhan Rakyat” programme organised by the Domestic Trade, Cooperatives and Consumerism Ministry, benefited all strata of people nationwide by selling goods at cheaper prices compared to market prices. “Under the JBD programme, there are 27 items sold with cheaper prices of between five and 20 percent compared to market prices, for example, cabbage that is normally sold at RM3.50 per kg in the market is sold at RM2, eggs per package of RM11 is sold at RM8.50 here. “Even whole chicken is sold here for RM10, while the normal price is RM8 to RM9 per kg, we have many more items sold at cheap prices, and we hope more people get this benefit,” he said when launching the JBD programme in Pekan today. Also present were Fama chairman Badruddin Amiruldin, State Rural Development, Agriculture and Agro-based Industry Committee chairperson Shafik Fauzan Sharif and State Felda Affairs Committee chairperson Abu Bakar Harun and more than 10,000 local residents. The programme has been implemented in 718 Pasar Tani outlets, 426 Agrobazaar Kedai Rakyat, 110 Agrobazaar 1Malaysia, six MyFarm outlets, as well under the MyBest Buy programme nationwide. The entrepreneurs are involved in selling 27 selected items such as fish, chicken, vegetables, groceries and control items with percentage discounts directly to consumers. At the same event, Najib also launched the Local Service [email protected] Tani and Pasar Tani Application, equipped with basis information such as location, operating hours, attractive products and sales promotions at the Farmers’ Market. The maiden launch is one of the added value of Fama’s services to disseminate information concerning the farmers’ market to consumers. Consumers can also enjoy the facility by uploading the app that can be downloaded for free from the Google Store and Apple Store. 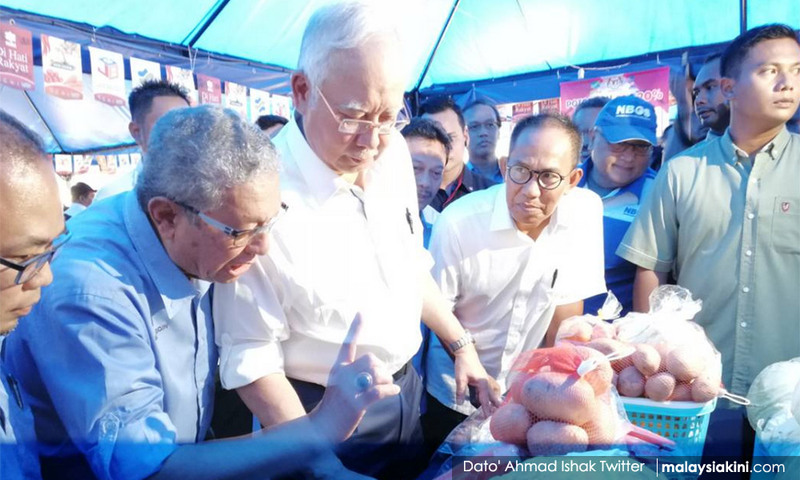 Najib, who is also Pekan MP, also launched the QR Pay to facilitate consumers and traders at the farmers’ market, and Fama’s effort towards a more modern trading system transformation. For the implementation of the programme, Fama also worked closely with Maybank to implement the QR Pay at Fama retail outlets, including at Farmers Market, 1Malaysia People’s Agrobazaar, Fresh Fruits Stalls, MyFarm outlets and My Best Buy. He said Malaysia was heading towards a cashless society, with only a cash application needed as no cash was required for shopping, as being practised in other countries such as China. “In China there are 310 applications for micro credit processes where micro credit loans can be processed in just three minutes before approving them after knowing their credit worthiness via data available in that system. “I mentioned this because I want to imagine the world has changed rapidly and what is done today is the starting point for us to move into a new world in the future,” he added.